While certain features will be common across the GeForce GTX 1660 Ti family, some are specific to each vendor and SKU. It will come as no surprise that ASUS ROG claim plenty of distinctions between their STRIX variant and their competitors across performance, cooling and reliability categories. ASUS have once again matched their premium card variant with the now familiar ROG triple-fan cooler. In terms of maximum cooling potential this design is clearly over-engineered for the requirements of a mid-range 120W GPU. Nonetheless the design should allow for relatively low rpm operation across its three fans when the card is under load. The current generation of this cooler has a tweaked 'Axial-Tech' fan design rather than the 'wing-blade' fan that's been used until now. Within the same 35db acoustic envelope the new fans increase air flow by 27% and static pressure by 40% relative to the old design, and maintains high dust resistance standards. ROG's approach to cooling and performance is augmented by the card's two BIOS options. This Dual-BIOS system switches between Performance and Silent Mode BIOS profiles that adjust default overclocks and fan curves. 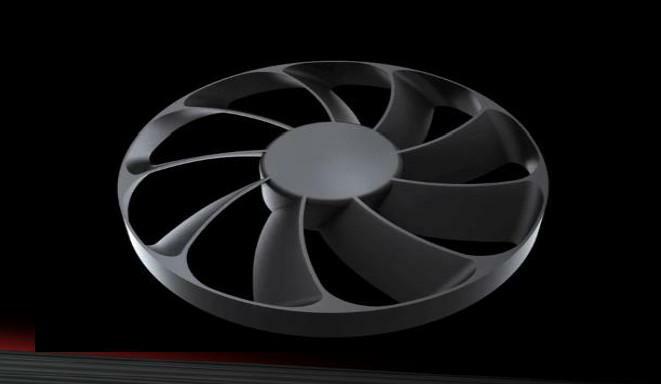 Fan curves are substantially more aggressive under Performance Mode, while the Silent Mode prioritises low noise and 0db operation below 55C by stopping the fans entirely. The oversized nature of the STRIX heatsink means that the Silent Mode has no chance of causing issues when GPU load spikes, and fans can ramp up gently. Offering additional cooling control are two aux. headers compatible with 3-pin and 4-pin PWM fans. In concert with the Fan Connect II software, fans connected via these headers can be adjusted dynamically to both GPU and CPU temperatures in a manner that ensures balanced system thermals. When utilising the Performance BIOS (the ROG STRIX GeForce 1660 Ti's shipped default) the card has a substantial overclock of 1530MHz Base and 1890 MHz Boost. That's a hefty increase when you compare it to reference specifications of 1500MHz Base and 1770 MHz Boost, and is compounded by the a high quality cooler allowing it to run at the higher Boost frequencies for longer than is typical. The likely performance gain from this overclock shouldn't be understated, but may mean that the card has slightly less overclocking headroom beyond that point for enthusiasts. In common with the rest of the ROG STRIX GPU range, this model incorporates configurable RGB LEDs utilising their proprietary Aura Sync lighting system. This allows for synchronisation of lighting effects across Aura Sync-enabled hardware and peripherals and a wide selection of customisable effects to choose from. As with all aesthetic options the value you place on it is down to personal taste, but Aura Sync remains one of the more comprehensive systems on the market in terms of both functionality and support (ASUS-specific and 3rd party). Plus, you can turn the entire lighting system off with the press of a button if you so desire. This card also adds a single 4-pin RGB header at the rear for additional controllable lighting, which is a nice touch. RIG STRIX GPUs are the more heavily engineered cards on the market and often emphasise a rugged design that compensates for the more weighty cooler. Such is the case here, as the GTX 1660 Ti version incorporates both a hefty backplate and bracing front faceplate. Together they reinforce against torsional forces acting on the PCB, especially those focused around the PCI-E connector and cooler mounting points. 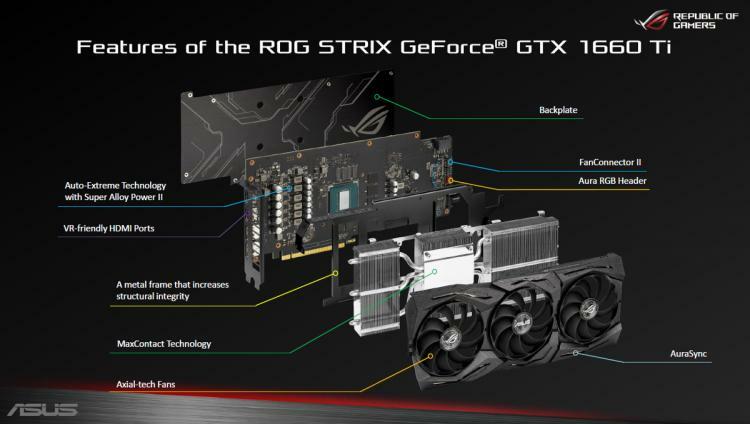 Clearly the ASUS ROG STRIX GeForce GTX 1660 Ti is in the upper echelons of feature sets, although we should note that it doesn't incorporate the VirtualLink connector. ASUS enthusiasts who aren't quite as demanding will be pleased to know that other SKUs with slightly lower feature options are available from the non-ROG side, including ASUS DUAL and TUF GTX 1660 Ti models with twin-fan cooling.